I have just bought a replacement elbow and it appears that the original one has a different offset. I have checked photos etc of new engines and they all the same offset. The one off my engine tends to point straight. Do all Hanse installations have the straight option ? 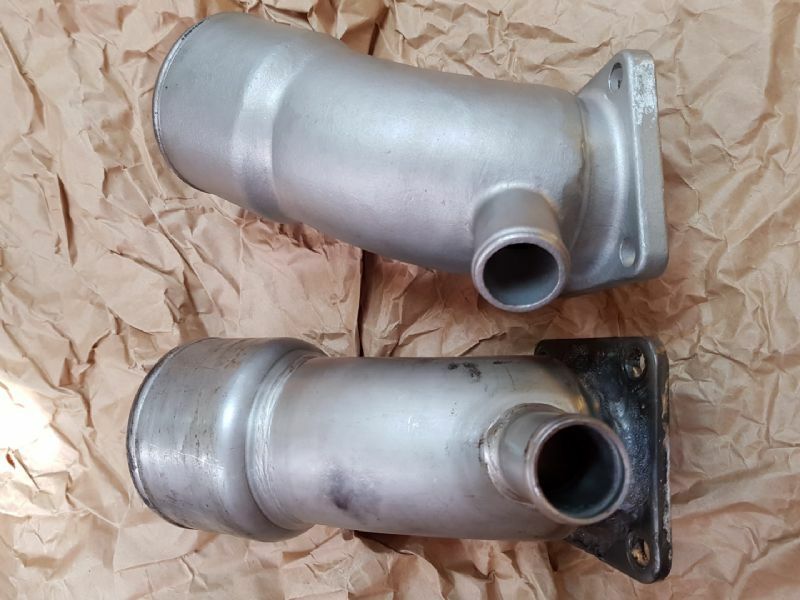 Was the exhaust elbow modified during installation ? The weld on the 'old' one is a repair job as the weld was cracking. i guess as long as the mating flange is the same and you have the room for the slightly different hose angle it shouldn't make any difference really. May have to cut the back board to adjust the angle. Could not get it to fit easily. The new one seems to be better than the Yanmar item and was a lot cheaper. Yanmar quoted NZD800. Do you have a Yanmar 3JH4E ? I have 3JH5E, mine is straight like your original, maybe get it cut and welded locally or have you tried ebay for straight one? Hi - Not been able to find a straight one. I will probably look at making the exhaust hose fit a straight and the new one. I just checked on my 400 from 2006 with 3JH4E, it is also straight.